When a company reaches the end of its financial year, the people in charge of accounting review the results of that year. Of course, in the event of a negative result, as this establishment has not made any profits, it is exempt from this corporate tax. This corporate tax simulator is useful for all companies that have made a profit during their financial year. 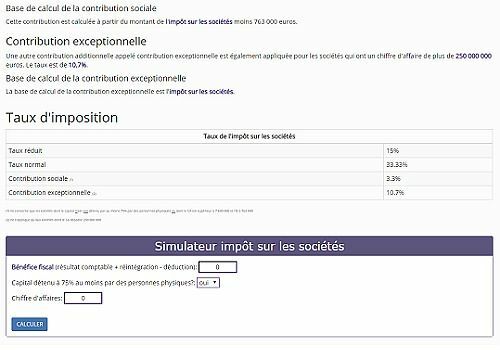 To do this, this simulator uses your taxable income. The latter corresponds to your accounting result, to which you will have added or deducted any items from the accounting result, such as non-deductible fines for example (which must be reinstated in the amount). Once you have entered this tax benefit, you must ask yourself whether at least 75% of the company's capital is held by individuals. This question is important because it helps to determine the amount of your social contribution. Finally, it is also up to you to enter the turnover of the company concerned, and click on the "Calculate" button. This tool is really very practical because you no longer need to take into account a different rate above a certain amount of turnover, and it avoids possible human errors in calculation. Are you a resident of the United States and pay your taxes there? Turbotax helps you to write your return and get serious discounts.